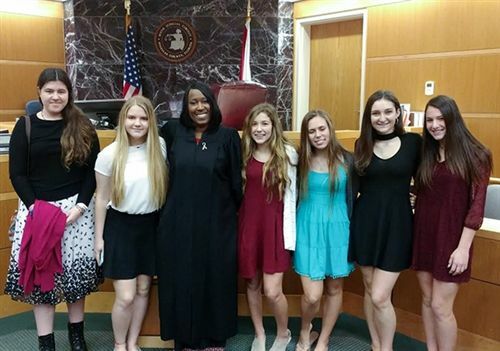 On January 29, six teens from the Guardian Ad Litem Service Club got the amazing opportunity to go to the courthouse and sit in on some family court hearings. They saw court hearings that varied from arrested teens to custody and foster care cases. The visit was very eye opening, especially because most of the arrested teens were around the same age as the Club members. It was hard to watch some of the parents of young children who were having to be pushed and pulled between both of their parents. Some of the cases were more complicated than others. "One of the cases included a biological father, a legal father, a biological mother, and then there was a child in the middle of all of that craziness. The biological father had no rights to the child, and the legal father wanted no part in the whole thing. It was hard to see kids whose parents could not get along for the sake of their own child. One case we saw had a very happy ending when a mother who has been working hard to regain the custody of her daughter for a long time was finally granted just that." said Rachel Cannella '21. At the end of all of the court hearings, the Judge allowed the Chargers to ask her questions, and her answers gave them a great understanding of the system.